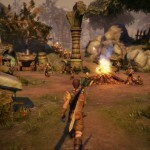 A few days back we shared with you a video from Lionhead Studios teasing what looked like an HD makeover for their classic game, Fable, but that it could also have been teasing a full remake of the original favorite and perhaps even Fable 4. 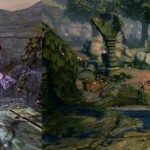 As it turns out, however, speculation was completely and utterly useless, as Microsoft had already confirmed that a new remastered version of Fable being called Fable Anniversary was on the way for the Xbox 360. Complete with The Lost Chapters, of course. These things happen, what can I say? That internet, it’s a jungle. As you can see by the comparison image below, the work they’re doing is absolutely phenomenal, and fans of the franchise should be more excited than they’ve been in a long time. Sure it’s a game they’ve played before, but it’s also a great game that will look better than ever. But it’s not just the game’s look they’re updating. It’s everything. The whole world is touched up with new lighting, new textures, new facial animations, new models, and even new cut scene animations, all in glorious 1080p HD. The game’s been given an entirely new interface with a new save system and minimal load screens as well. But wait, there’s more! A collection of achievements have been created for Fable Anniversary, a first for the number one original Xbox (hey, that gives me an idea for the name of the third generation model!) game, and it will also include SmartGlass support. Last, but certainly not least, there will indeed still be endless chicken kickin’ to be had…only now there will be a worldwide leaderboard, so that everyone will know who’s the very best chicken chaser of them all. Now that we know Fable Anniversary is officially on the way, the next question is whether Microsoft and Lionhead unveil a shiny new Fable game for their shiny new console later today. There’s not a better time than now for Fable 4 to arrive and try and restore faith in the franchise. There’s lots of games on the way I’m excited for, but I’ve also been wanting to play the original Fable with The Lost Chapters (the only way to play it, in my humble opinion) for many years now and never got around to picking up an old used Xbox copy of it. So consider me extra excited for this one. 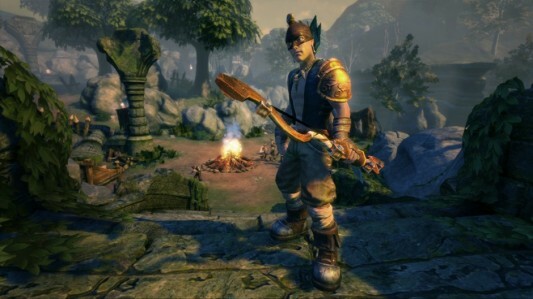 Will you buy Fable Anniversary?